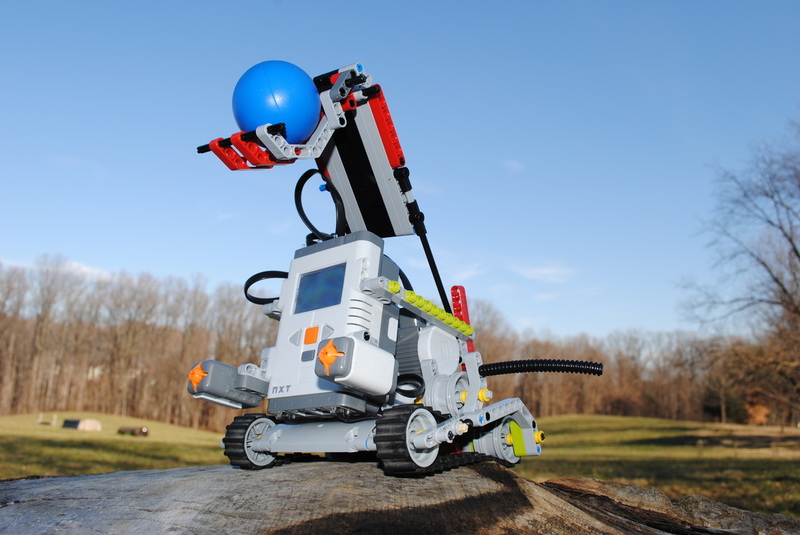 LEGO EV3 Robotics: (Grades 6-8) Students will learn to build and program Lego's intelligent EV3 brick using interactive servo motors, remote control, infrared and color sensors. Intuitive software with i-con based drag and drop programming interface will bring the EV3 to life. Build A Computer: (Grades 6-8) Ever wanted to build a computer from scratch? How about gaining hands on experience to see how a computer is put together? Join us for a week-long day camp to experience the process of building your own computer. Working in groups you'll learn the method behind computer building. Monday you begin with pieces and by Friday you will have built a computer and memories for a life time. LEGO Mindstorms Day Camp: (Grades 6-8) Students will learn about power and motor control and integrate math skills in order to program robots to travel distances and navigate angles. A friendly competition is the highlight of the this week-long camp. LEGO Minstorms Aquabotics: (Grades 6-8) Students who have participated in land-based robotics projects (although not required) will explore the complexities of the underwater environment present unique demands. They will design and construct an aquabot, design a controller, and create a program to attempt various challenges. Space Engineering Camp: (Grades 5-6) Campers probe with probes, design solar ovens, craft human sun dials, and experience astronaut training while exploring human interactions with space in this technology rich, interactive camp. Kids end the week with testing their Mars Landers with an egg drop! Space Engineering Camp: (Grades 7-9) Curiosity and a love of space propel campers through this week-long exploration of our relationship with the universe. Kids use technology to probe and experiment while creating science projects that fuel their desire to learn. Intro to Java Programming with Minecraft: (Ages 10-12) Why learn Java? Because Minecraft was built with Java code! Create simple creatures, then put those Java skills to the test by programming custom behaviors. Use resource packs, learn to mod custom blocks, and program with command blocks, then see how it’s all written side-by-side in Java. Now you can learn to code while building a custom Minecraft world. Minecraft 3D Game Design: (Ages 10-12) With millions of players worldwide, Minecraft is one of the most popular video games in history! Whether you are a veteran or new to the game, this is your chance to explore, build, and develop new skills. Learn how to host your own server, install and manage Minecraft mods, and accelerate your Minecraft game creation skills. Put your construction skills to the test with individual and team-based 3D design challenges. Finish up by developing your very own Minecraft map. Java Programming: (Ages 13-17) Unlock the power of code! Learn the fundamentals of Java—one of the most relevant, in-demand programming languages in the job market today. Java has many uses—from game development to business tools and 3D imaging. It is even the chosen language for the AP Computer Science A Exam. Get ready to create your own Java applications! C++ Programming: (Ages 13-17) Unlock the power of code! Learn the fundamentals of C++, one of the most popular programming languages on the planet, with applications spanning from systems software to video games. Part of a broad hierarchy of popular and powerful languages with deep roots in the C language, C++ builds versatility in young programmers. Utilize the industry-standard, integrated development environment Microsoft Visual Studio Express to create impressive projects. 3D Level Design with Portal 2 & Team Fortress 2: (Ages 13-17) Flex your level-design muscles with groundbreaking Portal 2 and award-winning Team Fortress 2 from Valve. Sculpt environments, manipulate lighting, add particle effects, and create new gameplay with the celebrated Source engine and Hammer editor. Take home your newly designed levels and a Steam account with full access to both titles. FPS Game Design with Unreal Engine 4: (Ages 13-17) Use the full suite of tools included with Unreal® Engine 4, the powerful technology behind the new Unreal Tournament® and Fortnite from Epic Games®. Utilize sample games from Unreal® Engine 4 to craft 3D levels and gameplay using Blueprint visual scripting. Unreal® Engine 4’s physically-based rendering brings lighting and environment detail to an entirely new level! LNC Summer Camps are a great way for kids to learn about nature while having fun! Camps at Louisville Nature Center offer fun games, guided hikes in the nature preserve, and exciting nature study for budding naturalists--ages 4-12! Our camps provide lots of hands-on learning about the local wildlife and habitats found in Beargrass Creek State Nature Preserve--a 41-acre forest and outdoor classroom. Summer Adventures provide children an immersion experience in the natural world. They take on the roles of naturalist, scientist, and explorer as they discover new things about the forest, and the creatures that inhabit it. By combining educational activities and learning experiences with traditional summer camp fun, your child has an educational adventure they will remember for a lifetime. Camp activities include nature study, crafts, science experiments, games, journaling, hikes and animal contact with the Forest’s education animals. Each session runs for one week. Adventure Camp: (Ages 7-12) Is your child an adventurer, ready to explore what’s around the next bend in the trail? If so, then Adventure Camp is just what your child needs! Campers explore the trails deep in the forest, climb our alpine tower, and learn orienteering, archery, and survival skills. Water Wonders: (Ages 7-12) Discover the exciting world within a pond, lake, stream and river. Campers explore a lake by canoe, play in a flowing creek, and hike through a forest to a winding stream. Personal Floatation Devices are provided to each camper and trained staff accompany the campers in a 1:3 ratio for our canoe excursions. Parents are welcome to join their child for canoeing field trips. Animal Adventures: (Ages 7-12) Do your children love animals? Campers explore and search for signs of animals in a variety of habitats and meet our forest education animals up close. What animals live in Kentucky? Find out and discover more about our native animals in the Forest. Nature Camp at Locust Grove: (Ages 7-12) Travel back in time more than 200 years to discover nature and people through Locust Grove. Track native wild animals, experience Native American hunting and survival techniques, and discover life in the 18th century for the first European settlers and Native Americans. This hands-on nature camp will take kids on an adventure back in time! ECO Extreme: (Ages 13-15) Prepare yourself for adventure on a whole new level! This is THE camp that sets itself apart from other camps! From canoeing on the Ohio River to camping out under the stars on an overnight trip, you’re sure to get your dose of extreme adventure at ECO X Camp, all while learning fly fishing, backcountry cooking, canoeing techniques, Leave No Trace Skills, and more. School’s Out Science Camps (Grades 5-6) When school is out… Science Camp is IN! Want a fun, hands-on experience for your kids? School’s Out Science Camps offer exciting educational experiences for children in grades Pre K-10! Join us for unique topics designed to inform, engage and entertain! Forensics: Put your investigative skills to the test as you analyze fingerprints, create cast molds, and extract your own DNA! Busting Myths: You have heard them all, but do you really believe all those myths? Can you break into a building with antacids? Can you really walk on eggshells? Are there more germs on your toothbrush than in your toilet? Challenge each myth to see if they can be BUSTED! LEGO Mindstorms NXT Advanced: Designed for our LEGO Mindstorms NXT pros! Take a deeper dive into the world of robotics and coding in this elevated version of our LEGO Mindstorms camp. Mission to Space: These are the voyages of the Mission to Space summer campers! Your five-day mission is to explore strange new worlds, to seek out new life and new civilizations, and boldly go where no one has gone before. Campers will also complete the “Rendezvous with a Comet” Mission at the Challenger Learning Center – Louisville. Mysteries of the Museum: Since our building opened in the late 1800s, there have been plenty of mysteries inside our walls. Apply science to unlock the myths and secrets found in museums from all around the world! Microbiology: Who is Patient Zero? Investigate the world from a microscopic perspective as you step into our BioLab. Are we prepared for the next epidemic? Find out as you solve an outbreak by searching for patient zero and identify the responsible microbe. STEAM Immersion: Our science immersion program is designed to give middle school students a behind the scenes look at what it means to work in a STEAM field. Each day, students will focus on a particular area or career. They will visit labs, interact with professionals and discover what it takes to pursue a STEAM career. Journey Through the Cosmos: Uncover the universe and worlds unseen with a scientific exploration of black holes, space-time coordinates, solar flares, and galactic collisions. Expand your horizons with behind the scenes stories of the heroic scientists on their quest of discovering the unknown. Will your story be next? Coders! "Hello World!" Want to try your hand at computer lingo? Dive into a variety of practical applications using coding: game development, 3D modeling, robotics, and more! No need to be tech-savvy—just clever and willing to take on a challenge. We’ll guide you through the problem-solving & design techniques necessary for line-by-line success! STEAM Leadership and Collaborative Skill Building – 21st Century Skills: Using 21st Century Skills High School students will explore a variety of institutions along Museum Row to research careers, practice project management, and develop the tools necessary to work collaboratively with peers. The team building and leadership aspects of this program introduces students to what it means to excel in STEAM fields, while becoming responsible and engaged citizens capable of working well in groups. Through age-appropriate activities, talks, and discussions, students will learn how flourish in these careers. A^2 Awesome Algebra: (Ages 12-14) If you think algebra is “boring,” you obviously haven’t used chip boards, algebra tiles, and power trains to understand it. Discover that learning algebra CAN be totally awesome! Building balconies with rulers and pennies, using Jolly Ranchers to grasp properties and order of operations, and modeling equations with algebra tiles are a few user-friendly keys we’ll use to understand hard-core algebraic concepts. A^2 makes learning algebra fun and interesting. Broadcasting Basics: (Ages 10-15) Would you like to learn to shoot, edit and even star in your own video? How about learning to write to video? You could become the next great video producer, editor or even television host. Gain tips on how to make an impact either in front of the TV camera or behind-the-scenes. Bring your enthusiasm and, by the end of the camp, you'll be ready to host your own show on the internet. Building Imaginary Worlds: (Ages 10-14) If you can imagine it, you can create it! Discover how to build worlds made up of 3D people, animals and buildings. Add elements of fantasy with dragons, spaceships, aliens, spooky creatures or amusement park rides in that world. As you learn to animate objects in this 3D world, you will be learning the basics of 3D programming. We will be using SCRATCH, created by MIT, and ALICE, created by Carnegie Mellon University. Both were created to help students learn fundamental computer programming concepts in the context of creating animated movies and simple video games. Duke TIP Prep Camp (Grade 7) Each year the top 5% of all 7th grade students are invited to take the SAT to qualify as Duke TIP (Talent Identification Program) Scholars. If you are an accelerated learner who is in the top 5% of your class, come learn the skills you need to do your best on this challenging test. G3–Great Gains in Geometry (Ages 12-17) Dominoes, Pentominoes, Hexominoes, oh my! Learning geometric concepts can be “way cool” and fun. We’ll build towers with toothpicks and marshmallows, design rectangles with a limited number of cubes, and create colorful origami and artistic tessellations. Discover that hands-on activities can transform difficult geometry concepts into everyday skills. Movie Magic (Ages 10-14) This computer-based course will help junior movie-makers take a story from idea to screen. Students will work in small teams to create a story, make a story-board to plan out every scene and then film it! Back in the computer lab, we'll take our footage and edit it into an amazing mini-movie! (We might even add some special effects!) Come join us and bring out your inner Spielberg. Bring a USB thumb drive, minimum 4 GB. Please complete a Risk & Consent form when registering your child. Link to form found at the top of the page. Pixels to Paper (Ages 10-13) Are you creative? Discover how to take that creativity to the next level as you explore the basics of digital graphics: photo/image handling, creative lettering and layout. Using both professional grade and freely available online graphics tools, you’ll create several fun and exciting projects. You’ll take home a full color printout of your project and all your files. Study Smarter, Not Harder! (Grades 7-8) NOW is the time to develop the skills that will benefit you in high school and beyond. Learn tools for time management, aspects of efficient note-taking, clues to textbook reading, and tips on enhancing memory. You will also be provided with many strategies to help you complete assignments and tests successfully. Give yourself an edge! Web Monkeys (Ages 10-14) Hey! Do you surf the web and wonder how a page is made? Come learn how to design your very own web page! Explore the basics of HTML and CSS. Then you'll create your personal page, complete with text, graphics, photographs and more. Best of all, the site you create is yours to keep! Come monkey around with us! As the largest state-licensed child care provider in Kentucky, we make it our priority to meet or exceed the state standards of safety and quality. In addition, the Childcare Enrichment Program Summer Camp and Creative Adventures do more than just keep your child busy during the summer. Your kids stay engaged all while learning and exploring. This year, your camper has the opportunity to become a cowboy, explore the galaxy, make extra fun food, learn how they are unique, take part in a luau and much, much more. We make learning fun through enriching field trips and weekly, them-based activities that encourage kids to become engaged with science, reading, math and other fun subjects. Summer Safari Day Camps are back and we’re gearing up for an exciting summer! Join us as we explore the wild side of animals large & small, discover the big, wide world of our own backyards, and investigate the science & art of LEGO bricks! All camps include Zoo walks, large animal presentations, attraction rides and up close encounters with live Zoo ambassadors! Zoo Mazing Race: This camp will include Zoo related clues and tasks based on the reality TV show “The Amazing Race.” Complete with detours and roadblocks, campers will race around the Zoo! To the Extreme: Uncover the secrets of the animal kingdom’s most extreme inhabitants. Campers will explore some of the most unforgiving places on the planet — from the deep, deep sea to the hot, hot desert! How do animals survive in these habitats? Animal Mythbusters: The animal world is full of myths, legends, and sayings that are often not true. Campers will be busting myths all week during this fun and interactive program! Zoo Exhibit Design: Have you ever wondered how zoo exhibits are designed? During this program, campers will learn all that is required to create a new exhibit and design their own! They will meet staff that helped create the Louisville Zoo’s award winning exhibits like Islands, Gorilla Forest and Glacier Run. Special tours are planned so campers will understand the complexity of zoo design. Veterinary Visions: Can tigers get an X-ray? How do you medicate a snake? A career in the field of veterinary medicine is always fascinating and challenging! From preventative care to dental exams to surgery, you will learn about caring for the health of endangered species at our Zoo and what it takes to become a Veterinarian or Vet Tech. Get a behind-the-scenes tour of our on-site animal hospital, meet one of our veterinary staff members, and touch some of our small education animals! Wild Service Day! Here is your chance to participate in some hands-on projects that benefit your Zoo and give you some service learning hours as well! Possible projects include planting, making enrichment items for animals, cleaning, and becoming biofact ambassadors to guests. We will also see some education animals up close, AND even include a behind-the-scenes tour to thank you for your hard work! Rain or shine, we will be busy. Please dress for dirt! Eco-Avengers: Can recycling help save gorillas and their forests? Could carpooling protect polar bears and the tundra? Find the answers to these and other questions and become a true superhero for the planet! Everyday actions big and small will help us all to save endangered species and their ecosystems. Let’s explore conservation together through activities, contact with education animals, and a behind-the-scenes tour. Get ready to go green! Survivor -- Zoo Style! Did you know that certain lizards squirt blood at their predators, and one species of goose can flap to heights higher than the Himalayas as they migrate? Join us to learn about some of the weird and wacky ways animals have to survive. You will also see that the Louisville Zoo plays a key role in assisting the survival of many rare, exotic species. We’ll include a couple of friendly team challenges, contact with a few education animals and a behind-the-scenes tour!